How To Make My 2-Ingredient Kitchen & Bathroom "Miracle Cleaner"
I thought some stains were impossible to remove - until I tried this cleaner! I fear I am becoming like the dad from the movie My Big Fat Greek Wedding. You know, the guy who goes around spraying everything and everyone with Windex, and claims that it’s the cure for everything! My dad believed in two things: that Greeks should educate non-Greeks about being Greek, and every ailment from psoriasis to poison ivy can be cured with Windex. While I may have the same enthusiasm as the Windex-loving dad from the movie, my cleaner is of the homemade variety. The “miracle cleaner” that I’ll be sharing with you today is simply a combination of two natural cleaning ingredients – baking soda and hydrogen peroxide. Baking soda is a natural abrasive that’s great at whitening and deodorizing, and hydrogen peroxide is incredibly useful for disinfecting and sanitizing all sorts of things. Mix these two powerhouse ingredients together, and you’ve got one “miraculous” cleaner! This isn’t really a recipe per se, so I’ll just describe how I usually do it. I start by sprinkling about 1/4 cup of baking soda in a small glass bowl or ramekin. Next, I grab my trusty bottle of hydrogen peroxide and squirt some into the bowl. You just want to get the baking soda wet enough so that the mixture forms a nice paste. Then I scoop up a bit of the paste, and rub it on the offending dirt/stain/grease…whatever! I usually just use my fingers, but I’ve also applied it with the scrubby side of a sponge, too. 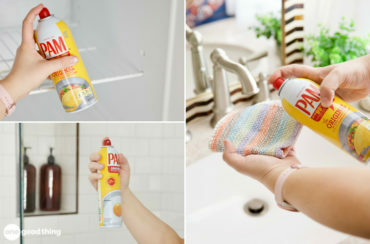 This cleaner is incredibly versatile, and I’ve used it to clean all sorts of things in both my kitchen and my bathrooms. Here are a few of the ways I’ve used it recently. What is it about those greasy stains on your cookie sheets (or baking sheets, or jelly roll pans, or whatever you happen to call them) that makes them so impossible to clean? I swear, before I tried my “miracle cleaner” on them, I had probably tried every store-bought cleaner in the cleaning aisle at least once. But those stains simply wouldn’t budge! But I eventually put my cleaner to the test, and as they say, a picture’s worth a thousand words! As you can see, the greasy stain is almost completely gone. There is a bit of remaining discoloration on the pan, but that’s not a problem for me. It just looks like I use it regularly, which I do! I don’t mind having my pots and pans look used, as long as they’re clean, you know? If there’s one common struggle that every Utahn deals with, it’s our hard water. Our water here is high in minerals like calcium, magnesium, and other minerals, which isn’t inherently a bad thing. However, it does create problems, like hard water stains on dishes and laundry, and mineral buildup around sinks and faucets. Before I started adding vinegar to each load of dishes to help combat our hard water, nearly all of our dishes has unsightly hard water stains. Especially my plastic cooking utensils! Now that I know about the vinegar trick, I don’t usually have to worry about it, but sometimes I forget to add the vinegar and the hard water stains come back in a flash. My Favorite Cafe Rio Copycat Recipes! It occurred to me a couple of years ago to give my “miracle cleaner” a try, and it worked better than I could have hoped for! I scooped the paste onto the utensils, gave it a good rubdown, and rinsed. The white buildup melted away, and my utensils came out looking like new! So while I was thoroughly convinced of my cleaner’s power in the kitchen, I hadn’t thought to use it elsewhere in my house. That is, until I needed to address my bathroom sink. I swear, I clean my bathroom sink on a fairly regular basis, but after awhile, makeup and hairspray seem to combine to form an almost impenetrable film on the faucet, in the basin, and around the sink itself. My trusty cleaner came to mind, and I decided to give it a try. And at this point, I wasn’t terribly surprised that it worked like a charm! That gunky film of makeup and hairspray didn’t stand a chance. Rust on porcelain sink ? Solution? How do I clean a new glass shower door. It is 6×6 and I don’t want to mess it up or haze the clear glass. Mix equal parts of white vinegar and water – it will remove hard water stains and leave the shower doors looking beautiful! Hi Jillee, you mentioned you pour vinegar into your dishwasher, do you pour it at the start of the wash cycle? And how much do you use? I have had to use a lot of hydrogen peroxide w/baking soda lately to de-skunk my dogs! Works amazingly. 1 qt hydrogen peroxide, 1/4 cup basing soda, tsp of Dawn detergent. Mix together. Spray or wipe it all over dog, careful not to get in eyes, let dry 10-15 minutes and then bathe dog in doggie shampoo. Skunk smell is gone! Has anyone tried this on a fiberglass bathtub? I wonder if the hydrogen peroxide will dull the shiny fiberglass finish. How long do you leave it on the cookie sheet? She said, in a different post, 2 hours and no scrubbing! Can leave on overnight for greater benefit on older cookie sheets! OMG! We’ve tried every commercial product out there to clean our grout in kitchen and bathroom. This worked like a charm. On top of it, the price is waayyy cheaper then commercial products. I am sold on this. Big thumbs up! I tried this on one of my cookie sheets with NO success. Can you give me some advice? I have also used lemon juice and baking soda, as well. Love it!